Applications are invited from suitably qualified candidates for admission into the University College Hospital (UCH) School of Nursing in October 2018. 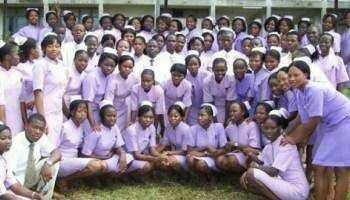 The course is for a period of three years, after which candidates will be presented for both the School and Nursing and Midwifery Council of Nigeria Final Examination to qualify as Registered Nurses (RN). Only interested candidates who should not be younger than 17 ½ years of age and possess the West African Senior Secondary School Certificate (WAEC) or NECO with Credit passes in at least five (5) subjects which must include English Language, Mathematics, Biology, Chemistry, Physics at not more than two sittings may apply. (i) The Receipt for the payment of a non-refundable Application Form fee of Seven thousand and Five hundred Naira (#7,500.00) only payable to UCH School of Nursing, University College Hospital, Ibadan, TSA Account. The Teller should be converted to the Hospital’s Receipt at the UCH Accounts Department before approaching the School of Nursing for the Form. (ii) Payment of Two Hundred Naira (#200.00) only into the Oyo State Nursing & Midwifery Committee Account, First Bank Ltd 2019704292. (iii) Four (4) Recent passport photographs which should be Colored but on white background only. 2.Applicant’s photograph with head covers (Hijab, Scarf, Beret etc) must show their full faces with both ears. 3.Completed Application Forms must be submitted by hand to the Principal of the School not later than Wednesday 11th July, 2018. 4.Submission of Application Forms start on Monday 18th June, 2018 and close on Wednesday 11th July, 2018. 5.Please Note: Failure to submit the Application Form on or before Wednesday 11th July, 2018 automatically disqualifies the candidate from sitting for the Entrance Examination. The General Nursing Entrance Examination Committee of the Hospital will conduct the Entrance Examination on 14th July, 2018. Only candidates who attained acceptable standard in the Examination will be considered for admission after passing the Interview exercise that would follow the Examination. Completed Application Forms must be submitted by hand to the Principal of the School not later than Wednesday 11th July, 2018. (Neither the School nor the Committee will enter into any correspondence with any unsuccessful candidate).